Q: Why do people who are already fingerprinted for state licensing, such as teachers and nurses, have to be fingerprinted again? A: Because of right to privacy laws, institutions may not share their information regarding fingerprinting. Anyone working at an entity of the Archdiocese of Miami or volunteering with access to children and/or vulnerable adults must be fingerprinted in our database. Q: Why can’t I just go to the police station to be fingerprinted? A: The Archdiocese of Miami requires a level II background check which includes state and federal checks. A local police department only covers its jurisdiction. Q: Who is required to attend Virtus training? A: All clergy, men and women religious, and employees of the Archdiocese of Miami are required to attend a live Virtus training session and maintain an active and up-to-date account by reading the monthly bulletins. Attendance and up-to-date status are also required for all unpaid ministry leaders and all volunteers with access to children and/or vulnerable adults. Q: Do ushers need to be fingerprinted and Virtus trained? A: Yes. Serving as an usher is a high-profile position at Mass. Ushers have access to minors and are recognizable as persons of trust even beyond the walls of the church. They also handle money. That’s why they are required to be fingerprinted and Virtus trained. Q: Do extraordinary ministers of holy Communion need to be fingerprinted and Virtus trained? A: The Safe Environment Policy of the Archdiocese of Miami states that those extraordinary ministers of Communion who serve the homebound and visit hospitals must be fingerprinted and Virtus trained because they serve vulnerable adults; and children may also be present in the homes. Those extraordinary ministers who only serve during Mass at their parish do not need to comply per the policy. However, we have found that in times of emergency, a pastor may not have the time to discern which of his extraordinary ministers is eligible to make hospital or home visits. Therefore, most pastors require all their extraordinary ministers to be compliant with both fingerprinting and Virtus-training. Q: Do I have to be fingerprinted and Virtus trained if I only serve once a year at the parish carnival/festival/bazaar? A: Yes. These types of events are fun for the whole family. Outside vendors often provide entertainment and/or run carnival rides, and the public is also invited — which means there are many people on hand who are not known to the parish community. In this case, it is especially important for parish/school volunteers to be compliant, so that they are educated regarding the warning signs of predators and inappropriate behavior that could endanger those trying to enjoy the event. Remember; Any event that attracts children might also attract predators. It is up to church personnel and volunteers to do all they can to keep everyone safe and ensure a good and successful event. Q: Can a pastor change the Safe Environment Policy for his parish? A: Yes and no. A pastor may not alter the Safe Environment Policy to be more lenient. He may, if he feels circumstances warrant it, make it stricter. This can only be done after consultation with the Safe Environment Director, Mary Ross Agosta. Q: Does it cost me anything to be fingerprinted or Virtus trained? A: The Archdiocese of Miami does not charge for fingerprinting employees and volunteers. Vendors or contractors would need to have their employer pay or pay for themselves. To determine whether you fit in this category and what the fee is, contact the fingerprint office at 305-762-1059. Virtus training is free. Q: Are children Virtus trained? A: Yes, but they do not attend the adult Virtus training sessions. Rather, they receive two age-appropriate Teaching Boundary Safety lessons per year. These lessons teach them about personal boundaries, safe friends, safe adults, and safe touches. They learn to tell someone they trust when they feel uncomfortable or unsafe. They learn to recognize grooming behavior. They also learn about internet safety and best practices. Q: Why do we have to go through fingerprinting and Virtus training when we didn’t cause the problem? Isn’t this primarily a problem with priests? A: Since 1999, the Archdiocese of Miami has required fingerprinting and background checks of all priests, deacons, religious, employees and volunteers in regular contact with children or vulnerable adults. That was three years before the scandal erupted nationwide, and Archbishop Emeritus John Favalora was the first to be fingerprinted, immediately followed by all archdiocesan priests and religious. In 2002, when the Archdiocese of Miami developed its Safe Environment Policy, in keeping with the Charter for the Protection of Children and Young People issued by the U.S. bishops, priests and religious also were the first to be Virtus trained. In the 1970s, the general rate of abusers was estimated at 4 percent across the board for each group. However, since the 1980s and again since the Charter in 2002, this percentage has gone down dramatically for priests. Statistics show that only 11 percent of abuse is committed by strangers, while 29 percent is committed by family members; 60 percent is committed by people we know and trust. That means 89 percent of abusers are people children know and trust. We call on our clergy, religious, employees and volunteers to be compliant so they can be made aware of the nature of abuse and the nature of predators, and so they can speak up when they have a concern and/or report when they suspect abuse. Likewise, we fingerprint everyone as required by Florida law, so that we know that those who have access to children and/or vulnerable adults have no prior history of abuse. By increasing the number of people who are trained and screened, we can make a difference and change the culture regarding this crime. Q: What types of things should we report and who do we call? A: There are two types of reporting: Communicating a concern and reporting abuse. Reporting abuse: In the state of Florida, all adults are mandatory reporters. This means if you know of abuse, you are legally required to report it. Also, in the state of Florida, adults are required to report suspicions of abuse. Additionally, there is a category of professionally mandated reporters. This would include people such as teachers, doctors and nurses. The difference is that mandated reporters are required to report abuse but cannot do so anonymously. They must identify themselves. The DCF Hotline is 1-800-96ABUSE / 1-800-962-2873. Communicating a concern does not necessarily mean knowing abuse has happened or will happen. 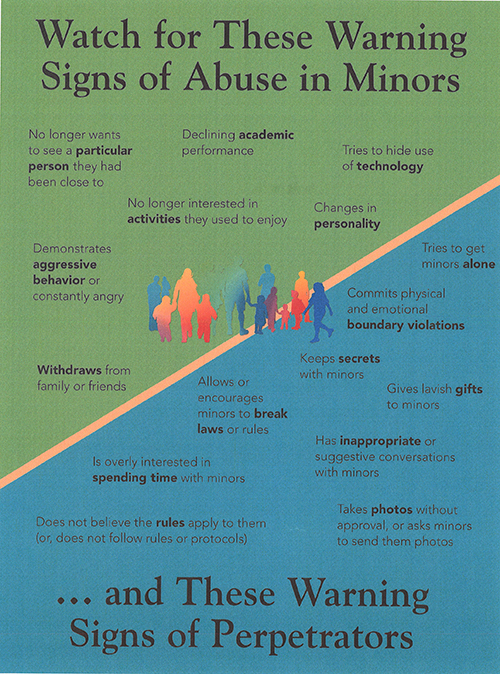 It involves identifying the warning signs of inappropriate behavior or practices. For example, leaving a windowless storage room unlocked during school hours, or a teacher meeting a student for one-on-one tutoring after school. In these examples, we may not be aware of any improper incident, but the situation should be addressed. It should be reported via the chain-of-command: in a school, to the teacher or principal; in a parish, to the parish manager or pastor. Jan Rayburn is Virtus training coordinator for the Archdiocese of Miami. Este es un gran articulo porque presenta las preguntas que mas nos hacen. Esta muy bien explicado. Gracias!! This is a great article. It answers the questions and objections I most frequently encounter. Easy read and explanation regarding the process. Should be shared with all stakeholders! This is the best question and answer article I have read explaining Virtus and Fingerprinting. Thank you! Great article! The segment explaining fingerprinting is very useful. When people have been fingerprinted for other agencies, they are frequently puzzled as to why they have to do it again. The differentiation between reporting abuse and communicating a concern was also a good reminder. This is a very helpful quick overview of ADOM policy and the reasons behind the various policies. I plan to keep a copy of this in my little "handy-dandy" facilitator kit. The article was very informative and covered many different area. 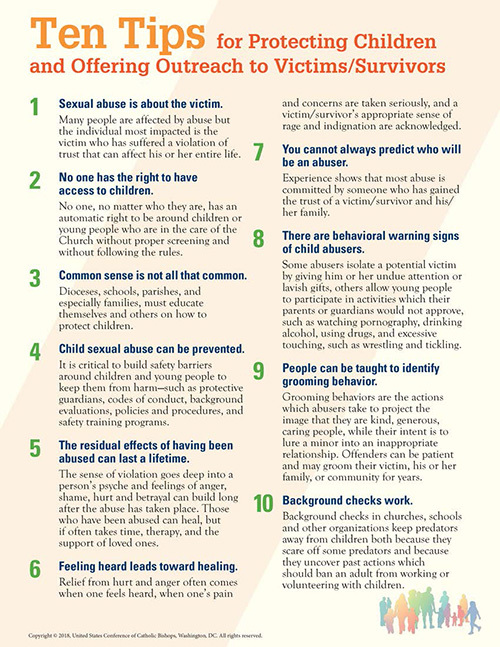 The 10 tips is a great flyer to educate those who serve the church on ways to observe and protect the young and vulnerable. This information was very informative and a great review! A thorough and very informative article!It answers the questions I am most asked. thank you! This is an excellent summary of the many questions asked before, during, and after Virtus sessions. Some of these pointers will be disseminated in future sessions I will facilitate since they are so to the point and answer so many concerns.